The policy of economic growth and reforming of industry and social sphere, proposed by the Government, is the way of creating a new, strong Ukrainian state respected by the world and respecting citizens, stated Prime Minister of Ukraine Volodymyr Groysman. Today, on 14 February, the Head of Government presented a report on the work of the Cabinet of Ministers in 2017 and the main directions of reforms in 2018. Volodymyr Groysman emphasised that the priority is to create a new quality of public administration with maximum use of digital infrastructure, intensification of decentralisation, as well as targeted and effective use of state resources, especially budget funds, for advanced budget programmes, including the “Available medicines” programme and the land, transferred to the ownership of amalgamated hromadas. “We managed to establish almost 700 AHs and start a high-quality regional policy. We will focus on state support for regional projects,” said Volodymyr Groysman. He reminded that the priority projects include infrastructure development, construction of new kindergartens, and development of the emergency healthcare network. 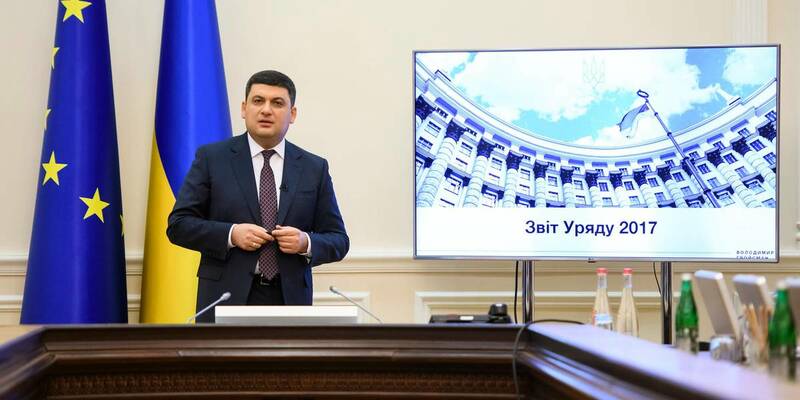 “All projects creating new jobs will also be supported in the first place,” noted Volodymyr Groysman. Similarly, the focus will be on the development of spirituality, culture, language, continuation of judicial reform, development of safety and defense sphere. “As soon as we provide a sense of safety and confidence, people will start returning to Ukraine,” said Volodymyr Groysman.